I'm up for this game! I just finished it a month ago on PC. Definitely looking forward to playing through it many more times on Wii! 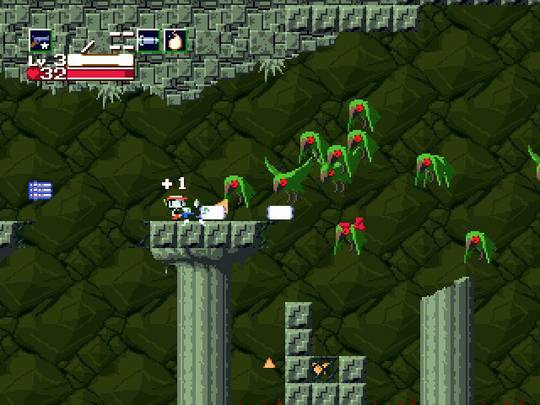 For 2D gamers, this is easily one of the greatest games since the SNES days. Maybe that doesn't say very much, but it's damn near perfect. This game is amazing....its a must own for me. This game looks even cooler in video form! Can't wait, even though updated graphics would've been nice. I'd love too see more shareware games come to Wiiware too, like Hocus Pocus (I'll give a cookie to anyone who remembers/ knows what Hocus Pocus is.). This game looks awesome! Also, I'm really digging the music, its amazing!!! Thanks for the vid. Now I really want it. I can't even think about prices because I just might this at any. Epic game, loved the PC-Version. Can't wait for this. At first I kind of hated the music in that video because it sounded like a crappy cell phone ringtone. Then it got stuck in my head ALL DAY! r the extras made by PIXEL himself? If the review is good, and the price is reasonable (no doubt it will be, with Pixel's generosity), I may consider a download. As long as I have Wii Points. And memory. And the time to play it. And the interest to play it. And the heart to clear the fridge. And a good review. And a reasonable price. And did I mention memory? Site's live now, guys. Check it out. The main page song is pretty cool, and fitting. EDIT: OMG the wallpapers are randomly generated. My brother got different wallpapers than I did. 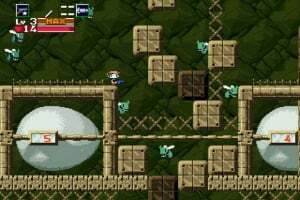 "Overflowing with unmatched charm and character, Cave Story takes players into a world where a race of rabbit-like creatures, called Mimigas, run free on a serene floating island." I saw the video, and I have to say, WOW! I definitely have to get this game! Can't wait! Absolutely brilliant game, and it will be great to play it on a TV! 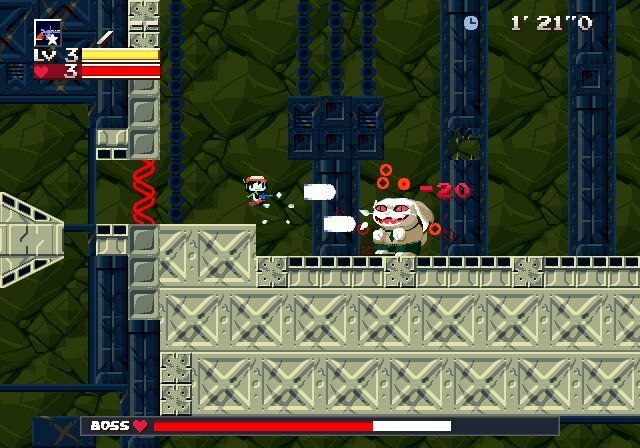 I've been hoping to see t on Wiiware since the service was announced, as in many ways Cave Story feels like a classic Nintendo game of yesteryear. Its spiritual home is on a Nintendo console, so the release is very fitting. 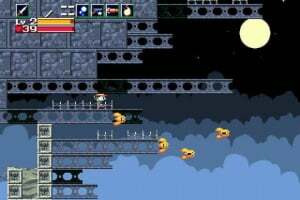 Wiiware's killer app? I hope this game comes out b4 Christmas. Love the music, really catchy. 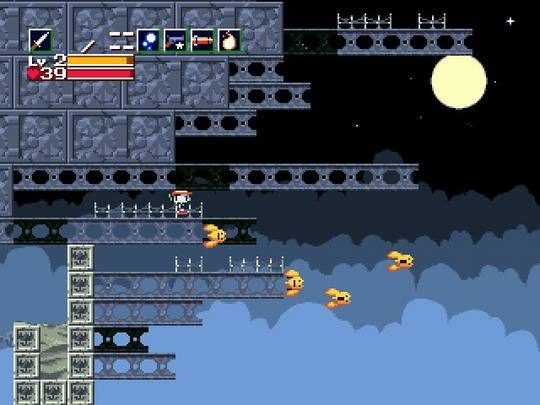 Reminds me of the guys at Nitrome or the guys who made Dino Run (you can find it at X Gen Studios). Can't wait! Wow, what rock have I been living under? This looks hella good. Looks like we'll both be disappointed. For some reason, I was under the impression that this was slated for an '08 release. Oh well. 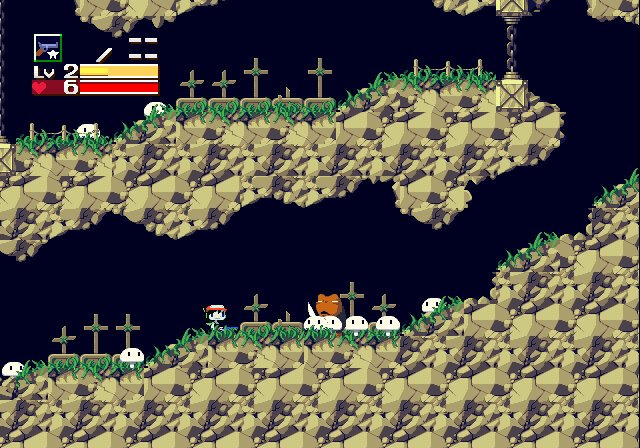 I couldn't get this on my computer, so this is on my "must buy" list for Wiiware. I'm waiting for the review, looks to busy. It was a singleplayer-only game. 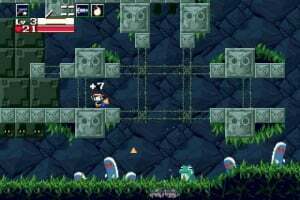 looks interesting not sure if it's worth the cash cause on PC is a Freeware game. Hay man nice to see you on this website! 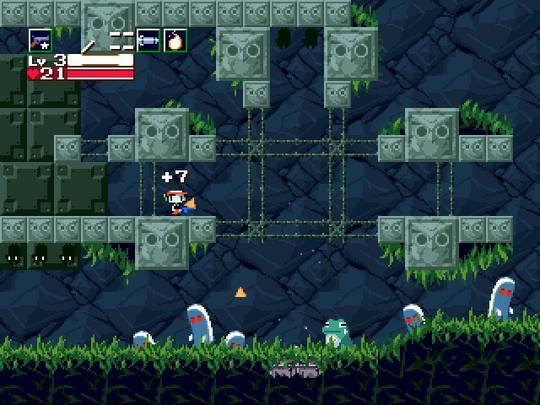 Never played Cave Story before so I'll definitely be getting this. I want to get this as soon as it comes out, but unfortunately since Evasive Space I always wait for the review before I make a purchase so the sooner the better! 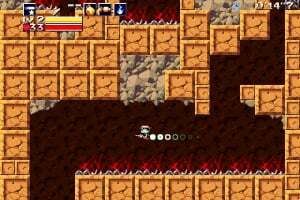 I've recently played a few hours of the freeware version. Its hard but a lot of fun and I can't wait for the WW version. meh, i dont like it...oooh, who will be the 50th person to comment? Man when will this come to America and NintendoFreak I guess it's me. 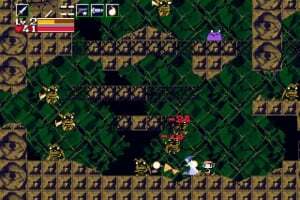 The only freeware game that I would rather have on Wiiware is Within a Deep Forest. That game would RULE if it had motion controls. they said we'll be playing by the beggining of may, and tomorrow is the first monday in may so there ya go . 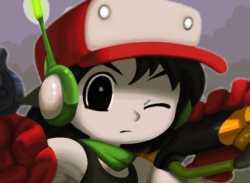 and, for those who think its not worth buying since the pc version is free, there's bonus content, music remixes and graphics approved by pixel, and you get to play using the wii-mote, how cool is that? The more I hear about this game the more I want it. 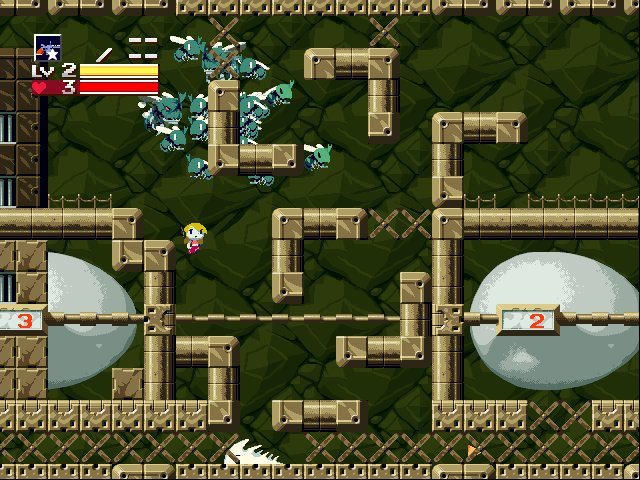 This could be a one of the very best wiiware titles yet. Though I'm still not sure its for me. so... just 3 weeks to go! huzzah! oh my gosh it's almost here! 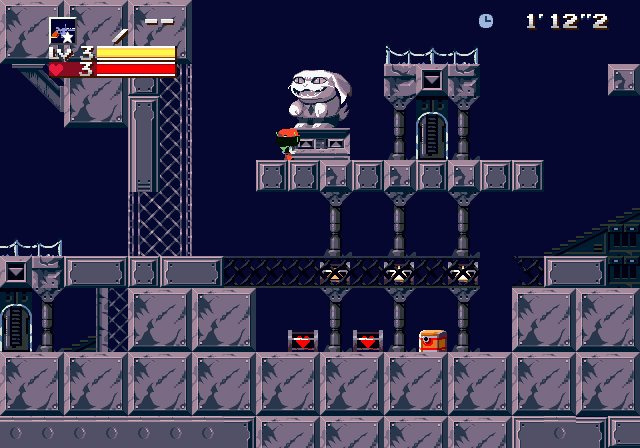 Graphically i have seen better in the nes day's but the gameplay looks to be solid or so i hope,maybe i'll give this a shot. I hope it comes out this week!! It's coming to Europe tomorrow, i just know it! It didn't ..though I'm in the minority who won't be downloading it. 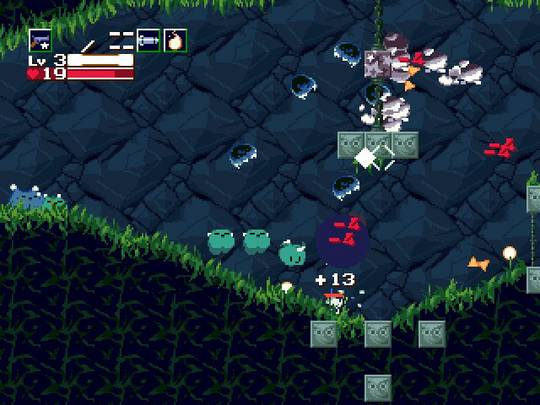 Words cannot express how disappointed I am that DeceasedCrab has no love for this particular iteration of the game. I, for one, still cannot wait to get my grubby hands on it. 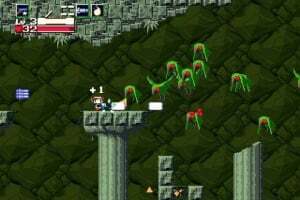 The success of a game like this on WiiWare should bode very well for the future of not only indie game developers on WiiWare but more platformers like Cave Story and La-Mulana to be commissioned for the service. It's a win-win as far as I'm concerned and an excuse to go for all-out completion on the game, experience the new visual/music upgrades, download the new content as it is released, and support Pixel with my money for his amazing work on this game in the first place. He has always deserved it. It's just a shame some don't see it that way. Who is that DeceasedCrab and why should we care. 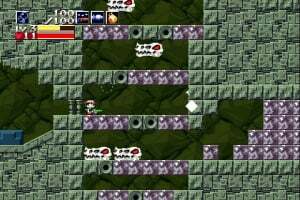 August is almost over so where is Cave Story? 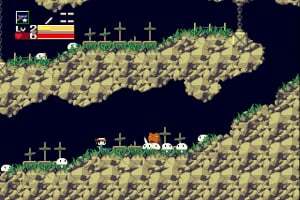 Not sure on this one looks like a full featured game, but from the video it seams too dated (mid-late 2D area). I will wait for reviews but I do not think I will be downloading this one. fffffffffffffffffffffffffffffuuuuuuuuuuuuuuuuuuuu- when is this coming out!? I will definitely purchase this one the day it comes out. I'm really hoping for tomorrow. On my two week break, need something to play. Edit: Damn. 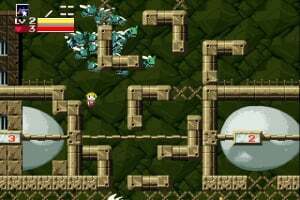 Well Lostwinds 2 is a great substitution for this. Dear lord, I'm sick and tired of waiting. 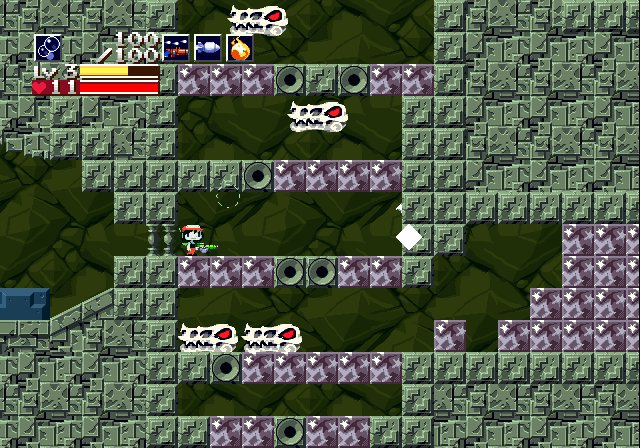 Playing Cave Story with a 360 controller is no fun! 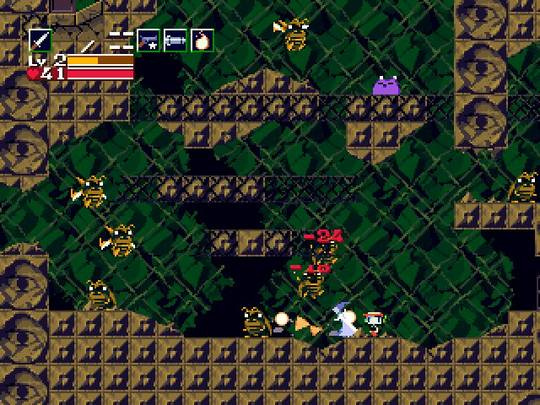 I can wait one more week, but as soon as break starts I'm going to play this on the PC and ignore the Wii Ware version. am i the only one who only has a passing interest in this game, but has been dying to get ahold of Night Game? You just might be the only one Tsuchinoko... I never heard of Night Game until now, I looked it up and watched the video. It's weird, could be good but doesn't come anywhere close to getting my interest as Cave Story does. Still waiting. I sure hope this game comes out soon. No Tsuchinoko- I can't wait for Night Game. Thought I am very excited to play this too. We'll probably see this sometime in the Spring. @Werbie yes it will come out in the US, and yes it has been forever. Everyone who doesn't get this game has horrible taste in games. this game is absolutely phenomenal. 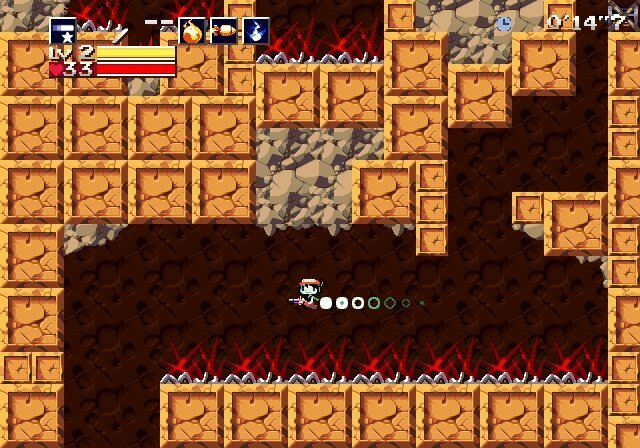 thanks nicalis! Nintendolife had best give this no less than a 10/10. -other than the sound and music, everything is beautifull! everything is so shiny and new! it looks the same but feels polished and just awesomer. dog 3: Arf arf arf! and that's what i have to say. i give the PC version 10/10 and the wiiware version 9.9999999999/10 because balrog doesnt yell huzzah, and that is the only reason . isn't the controls better with wii's controller than keyboard? If so, that's a real reason to rate wii version higher (and better graphics, of course). There are some subtle and not so subtle changes but over all I say it's dynamite! Truly one of the most inspiring games I have played/am playing! 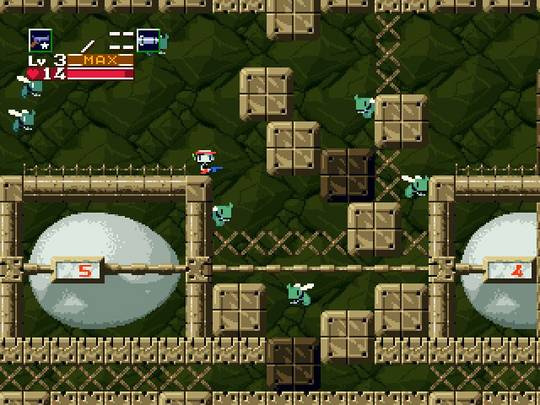 hard: play as mr. "i have no clue" and scream as you realise all the health capsules and missiles are gone! -balrog doesn't say "huzzah!" anymore and could be infringing on the kool-aid man's trademark of busting through walls yelling "oh yeah!" 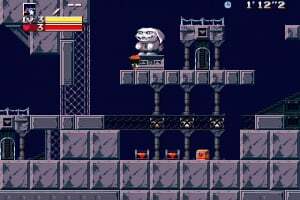 @Marioman64 With the game already available on the service it's highly unlikely Pixel or Nicalis will return to the game to alter the game. They spent a long time working on it, long enough for me to assume it's in the state they want it to be in. I didn't expect much out of this game at all being that usually games that are heavily hyped and beloved end up falling short for me, but I must say that I LOVE it. Very much. 100th post get! : D Also, amazing, amazing game. Yeah, this is an insanely good game. Also, I think it's worth mentioning that playing it on the Wii is far more enjoyable than on the PC. 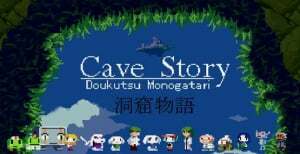 Never heard of this till I saw it here for WiiWare. I'm usually quite stingy when it comes to buying stuff from there but that was a near instant, whim, purchase. I don't regret it for even a millisecond. Amazing game and now I'm listening to the Remixed Soundtrack from here. Definitely the best WiiWare game. Another 8-bit like title I never knew before!